how to use ghee – Get Cooking! What Do You Get When You Combine SkinnyPop Popcorn and Melted Pink Himalayan Salt Ghee? 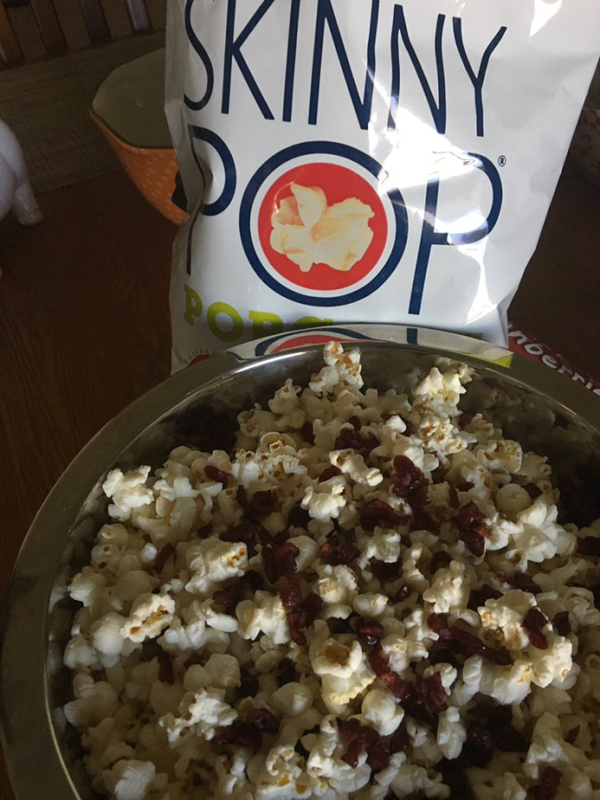 A while back, a super friendly woman contacted me about doing a post on my food blog highlighting SkinnyPop Popcorn. Since it was a brand I already bought regularly, I was more than glad to help spread the word. This isn’t a sponsored post – nor did I receive any popcorn to sample. I bought my own, as I regularly do. Let me tell you a little secret about us food bloggers… we are regularly sent food products to review (whether we’re sent the product or a voucher, we’re compensated for the time we spend telling our readers about the food). If you see one of my kind (food bloggers) giving a “shout out” to a product for which we didn’t even receive a coupon for… mark it down… it’s one we’re already buying and loving. There are just certain “staples” you grab each week at the grocery store, right? SkinnyPop popcorn is one of my favorite staples. I regularly grab bags of their Original as well as their Sea Salt and Pepper. The Sea Salt and Pepper is actually my favorite – guess it’s because I’m a pepper fanatic, huh? Popcorn is one of my favorite snacks, period. It’s delicious, fun to eat, doesn’t make a mess (unless you cover it with caramel or chocolate… then it’s shall we say a mess that’s worth it! ), and nutritionally sound. I almost always have a huge bowl of SkinnyPop popcorn on the table or counter – so anyone who passes by can grab a handful and crunch their little hearts out. 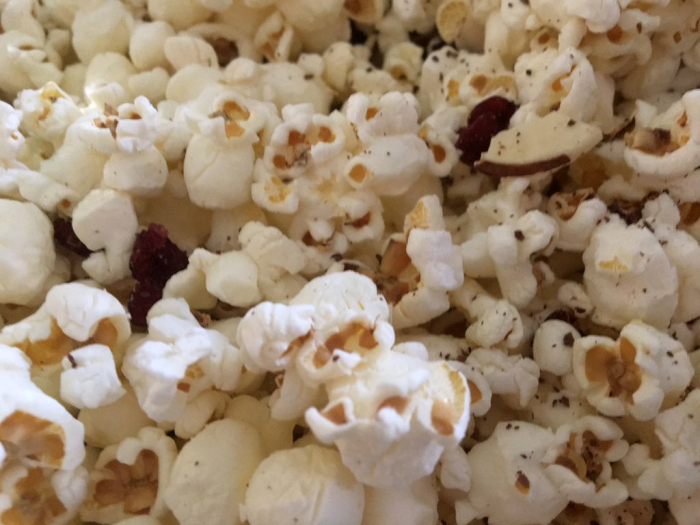 It’s a great way to hold off the hungries until mealtime and I’d much rather my loved ones grab popcorn than greasy chips or sugar-coated snacks. My husband and I often invite popcorn into the den when watching television in the evening or on weekends. A baseball game without popcorn? I don’t think so! 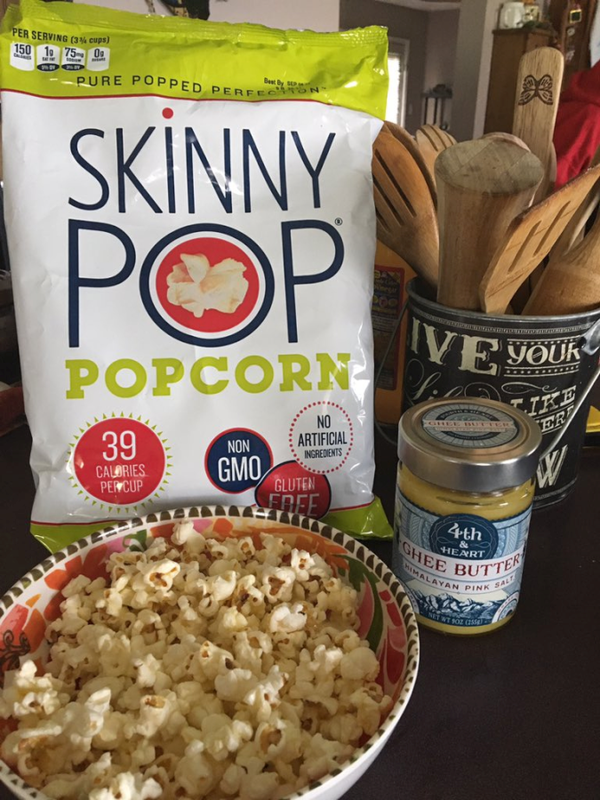 SkinnyPop Popcorn with Melted Ghee… HOLY CATS!! I recently happened upon what is now one of my favorite things in the world: SkinnyPop popcorn with melted Pink Himalayan Salt Ghee – naturally, you can just use regular ghee and add a little Himalayan Salt at some point in the melting or drizzling process, but I’d HIGHLY recommend the ghee pictured above – 4th & Heart Grass-Fed Ghee with Himalayan Pink Salt. It’s on Amazon (what isn’t, right??) but I’ve also found it easily in Meijer’s and Kroger. Again, any melted ghee would be fantastic, but this one is my “go to” for many things in life. Since I first melted ghee and used it on popcorn, I’ve never used traditional butter…. and I LOVE traditional butter as much as anyone. Ghee is just perfectly perfect for drizzling on popcorn and I could go on and on about how delicious it is. That, however, wouldn’t get the point across nearly as well as if you simply try it for yourself. You’ll be as blown away as me and, yes, you may even exclaim HOLY CATS too. One of the things I like about SkinnyPop so much is the fact that it’s…. … not Microwave Popcorn. Studies have shown that the majority of microwave popcorn is horrible for you. ….. doesn’t mess up dishes or call for vegetable oil. …. doesn’t mess up my hot air popcorn popper. It’s healthier than most snacks, healthier than all microwavable popcorn, and it doesn’t mess up a single thing. I also love that they print Gluten Free in huge letters on the front. They’re proud to be gluten-free and that makes me smile. While my absolute favorite way to eat SkinnyPop Popcorn is straight outta the bag (or bowl, if that’s where it’s hanging out at the time), I do like to get a little jazzy from time to time. Keep reading for a few ways to have fun with popcorn. 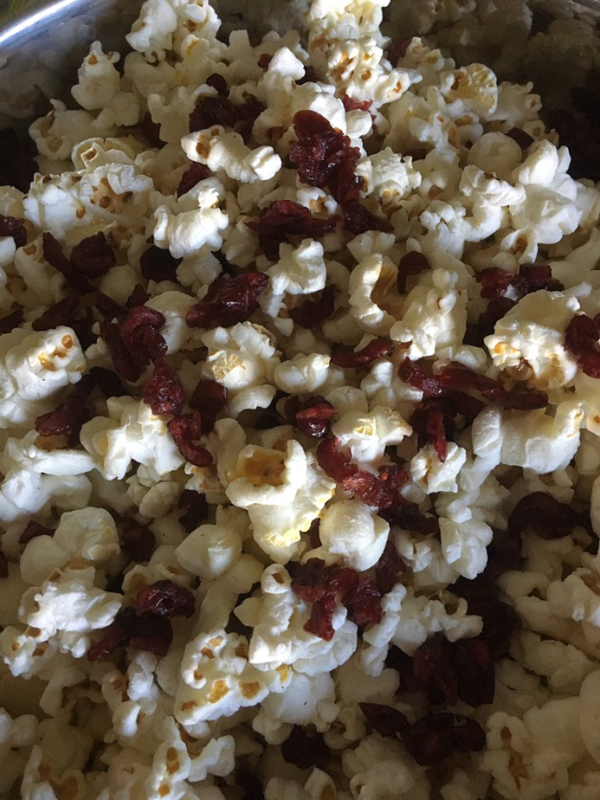 In addition to melted ghee (please, please try this – trust me it’s too good for its own good), below are some of my favorite ways to have fun with popcorn. I first fell in love with pouring M&Ms into popcorn at the theater many, many, many moons ago. I was trying to hold onto a huge bucket of popcorn (I go all out with theater popcorn, guys) and a box of plain M&Ms, while freeing up a hand to control my Diet Coke – yes, I’m that girl who has buttery popcorn, candy, and drinks a Diet Coke to wash it all down. At least I used to, that is. I gave up Diet Coke but candy and popcorn? NEVER. I decided that I either had to get creative or grow a third hand. I got creative. I poured the M&Ms into the bucket of popcorn and something legendary was born. Since that day (seriously, it must have been at least 25 years ago), I always have M&Ms in my popcorn at the theater. I often do the same at home. If you buy the “Baking M&Ms” bag, you’ll get more candies for your buck – plus they’re smaller, so you get more with each handful. Lawry’s Seasoned salt is great on popcorn – plus it gives it a funky cool color. Grating dark chocolate or white chocolate onto popcorn is also a darn tasty way to go. Nuts are incredibly good for you, so I like to sneak them into our meals and snacks any way that I can. Tossing pecans, almonds, macadamia nuts, walnuts, or pistachios into popcorn just ups the nutritional boost. Smart and delicious. I also like to toss in fried fruit sometimes. Experiment with the combinations of dried fruit and nuts for something extra special. One of my personal favorite combos is dried cranberries, almonds, and macadamia nuts. If I have any on hand, I’ll throw in some white chocolate morsels too. Cayenne pepper (if you like a little heat) and grated lime are a great combo for popcorn. The flavors go together perfectly. You can find SkinnyPop in your grocery store or your favorite super store. I just noticed on their website that they’ve added to their line of popcorn – I’ll have to keep my eyes out for these new varieties in my store. You can also find SkinnyPop on Amazon. I’ve kind of fallen in love with ordering food along with whatever I’m ordering on Amazon. Makes delivery day even sweeter.